What's the first thing you do when you get home from work, errands or all-day play? Take off those sky-high heels or clunky boots and slip into something warm and comfortable. These plush slippers from Sporto feature a soft, faux fur lining and indoor/outdoor sole to give you a look that's not only beautiful but blissful on your feet. Christmas gift for friend. She loved these. 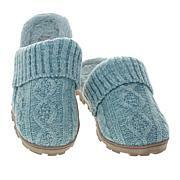 Love these slippers soft and comfortable where every day. it feels great on my feets nice and warm.